One of West Africa's best kept Natural Secrets. 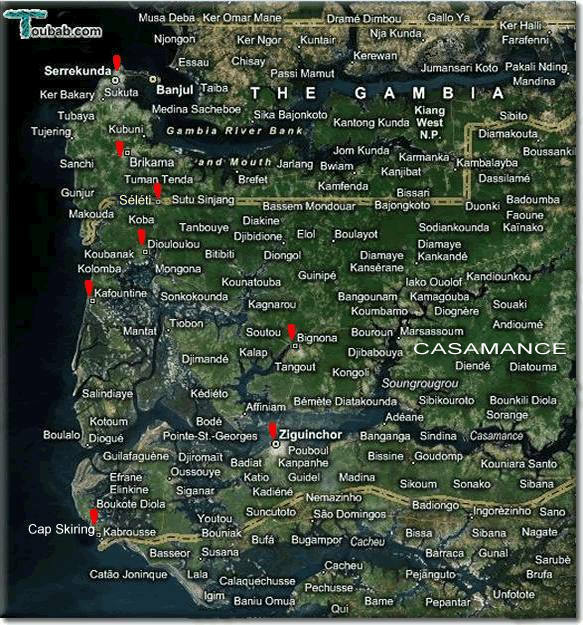 The Casamance is an area of palm groves, forests, mangroves and paddy fields at the southern end of Sénégal .. situated between The Gambia and Guinea Bissau. Although most of the region is fertile and supplies the rest of Sénégal with fish, rice and groundnuts, historically its people have benefited little in a financial sense from their labours and were badly let down with failed promises of being granted independence in 1980. Since then, many problems have arisen between local separatist movements and the Senegalese government based in Dakar in the North, spawning a state of low-level guerrilla war with sporadic armed uprisings, which have only recently subsided. Tourism used to be an important part of the local economy, but the past troubles and modern rumours of continuing unrest have predictably led to an almost complete cessation of tourism. It is only a short distance from my base in The Gambia and a region that I had previously and safely visited and enjoyed .. many of my Casamance friends told me it was OK to return, so I did. Unlike The Gambia and Northern Sénégal where 85% of the population follow Islam, the people of the Casamance - the Casacais - are equally divided between Christians and Muslims. But over and above either religion, most of them preserve and practise their ancestral beliefs as animists. Animists believe that all elements of nature .. human, animal, vegetable and mineral .. have a vital force. Fetish worship, sacrifices and ritual ceremonies, accompanied by traditional music and dancing, are regularly practised throughout the Casamance. Many of these ceremonies are practised in secret amongst the tribes concerned .. but music and dance festivals are a joy to attend, especially as they are not 'staged' for visitors, but are genuine age-old cultural traditions. with Peuls ( Fulani ), Wolofs, Lébous, Sérères, Baïnuks, Mandjaks, Mancagnes and Balantes. Whist French is the national language, each tribal group has either its own completely separate language or a local dialect, quite distinct from their neighbours only a few kilometres away. Most of the roads are well surfaced, but often circuitous, due to the numerous wetlands, mangrove swamps and waterways .. which radiate out from the Casamance River and cover a large area. The following pages describe my Springtime 2006 journey from the UK to The Gambia and onwards through the Casamance to Cap Skiring .. as shown by the red beacons above, some of which are linked for use as quick page finders. Occasionally, I have also added some of the past photographs taken on my visits during the 1990s .. showing the differences between then and now. These pictures were taken many years before the advent of digital cameras and some are of poor quality .. but they show the changes which have occurred since my first visits, for better or worse. With the advent of the excellent Google mapping technology, it has been possible to include static satellite views of the areas travelled .. also .. people with fast download connections can follow and zoom in on the routes described, from the page links which are referenced. -If the subject matter of the text interests you, click on the nearest thumbnail picture or text link to be taken to other pages with larger pictures and more descriptions of the subject or area involved. to follow the text and hopefully enjoy the story.